The Microsoft Lumia 950 XL is expected to be unveiled at a Microsoft event in the Big Apple on October 6th. Today, a screenshot of the device running build 10547 of Windows 10 Mobile was leaked, confirming many of the specs that were rumored about the phone. For example, speculation that the device will have a screen that carries a 1440 x 2560 QHD resolution, is confirmed by the screenshot. The screen size is expected to be 5.7-inches. The screenshot also confirms that the Lumia 950 XL will have 3GB of RAM inside, and feature the Snapdragon 810 SoC. That means that the phone will be powered by an octa-core CPU, with the Adreno 430 GPU handling graphics. 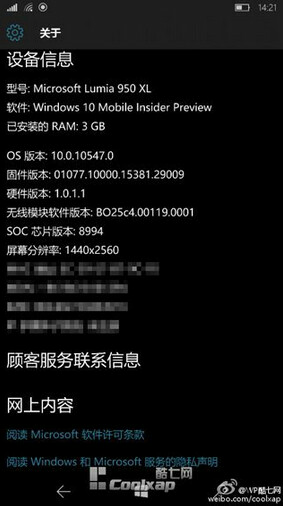 Other rumored specs not listed on the screenshot include the 20MP rear camera with OIS, and the front-facing 5MP snapper. 32GB of expandable storage is aboard, and the phone is powered by a 3300mAh battery. Speaking of the battery, the handset comes with support for Qi wireless charging. If you're a Windows Phone fan, make sure that you have October 6th circled on your calendar. Besides the Microsoft Lumia 950 and Lumia 950 XL, we could hear about other new Lumia models coming, the rumored Microsoft Band sequel, and the Surface Pro 4. I've never used a lumia phone due to...I don't know...usually it lacked in specs. This one is fully spec'd out. Now might be a good time to try one out. The new iPhone is disappointing and no android phones really peak my interest besides the blown up s6 called the "note 5". If the note 5 had a nice leather back. I'd be all over it. Cause that would be sweet. I put lumia instead of Windows. I meant windows. What are you saying? I mean I a windows fan but what do you mean by "the new iphone is disappointing"? Apple hasn't made so much sense In years like they did with 6s. And 'note 5' or any samsung phone is better without leather! Leather is not a good phone finish, sammy only experimented it to see if it can be, and if it can solve the problem of phone sliding out of hands, but it turned out the wrong way. If you still want leather get a pouch! Just buy the lumia if you want one and stop giving lame excuses. I have had the lumia 1520 and in terms of camera quality, smoothness, build quality, and overall quality it was one of the best phones I ever had. Too bad mediocre OS and totally s**tty app store made me sell it in less than two months. Im digging the lime green color. Damn now even Windows Phone has passed up the iPhone 6S Plus in specs. Man Apple is always trailing in the specs department. Eh... just get almost new lumia 1520 for 220 bucks on ebays as I did. More screen for 20% of the money. It is great device, I have 2 from ebay. However. It is not new, does not have warranty. It will be slower, doesn't support faster usb-c, nor continuum (which I want) and hopefully a upgraded 20MP snapper. Oh please stop sayign that WP lacks apps, yes 2 years ago it was lacking apps but now that is just bullsh!t. Maybe a few apps are missing but saying a huge anount is just not true. And WM10 can port ios and android apps.......so stop spraying nonesense! 1: Why use Google Maps if you have Here Maps? Here is way better and you can use it offline! Also you can download all maps! 2: There are a lot of video editors. 3: You have also alternatives of apps that are not in the store, and if an app is not availlable........this an developer thing and not a issue of Microsoft! & moreover it has all the basic apps people generally use & on par with ios & android counterparts. Along with win10 moblie a lot of apps are going to be available so there actually wouldn't be any problem with win10 platform so Lumia 950 XL is going to be a great phone with great specs with an awesome OS filled with apps! I really hope this comes to Verizon. I really want this to be my next phone. just as i was expcting.....MS will provide their phones with all the features they can think of. & really high end specs !! SD 810? Yikes, I'll pass. Folks I wish those who make and sell apps would tell the General public WHY they do not make apps for .mart phones. this is getting ridiculous ! there are People like me who like Windows smart phones we deserve good apps. better still you developers out there should submit your complaints to Microsoft and iron things out so Windows smart phones can get better Apps. Hmm if something cannot be done to improve things Microsoft will have to hire Programmers to make their own Apps for their Mobile devices.